"Ferndale" is a large, very private and quiet, fully self-contained, stylish apartment, appointed graciously with comfortable furniture and accessories. Nestled on 200 acres of rural farmlands, its charm is enhanced with landscapes of rolling highland views, grazing pastures, native bush and a secret rain forest. Our farm is a genuine working cattle stud with an organic olive grove and vegie patch, handled always with a sympathetic approach towards our environment and locale. We're ever mindful of the responsibilities and sensitive demands of farming; our animals (Wagyu cattle & miniature Shetland ponies) reside quietly as our friends, our lawn-mowers and our compost makers. The apartment exudes a warming and homely tone with electric blankets, fully insulated floors, walls & ceilings, block-out curtains and dependable gas heating, creating such an ambiance you'll want to snuggle up, feeling cosy and secure, day or night. Feel spoiled in the spacious bedroom with French provincial queen bed and furniture, crisply ironed linen, complimentary fluffy dressing-robes, toasty duvets and electric blankets, all of which repel even the chilliest Highland frost. The bathroom features a large shower, vanity and toilet, heated towel rail and heating lights. We promote careful consumption of water using the latest energy-saving bathroom accessories as we are fully self-sufficient, collecting only fresh rainwater for domestic use. The modern kitchen is intended for self-catering purposes with ample cooking facilities and equipment. A convenient BBQ is also available for your use. Continental breakfast provisions are included in the rates. Feel relaxed upon waking as your provisions are readily available so you can please yourself when you'd like to breakfast. Our late check-out (1pm) assures a restful and unhurried meal and casual mood after a leisurely sleep-in. Use the sun deck for outdoor dining and relaxing. It invites you into a total involvement with your country experience ~ fresh, restful & hearty country living and completely natural ~ gaze over the fields of dynamic grasses and an ancient apple orchard as you breathe in the cleanest of air.... it's nature's tonic for humanity, especially those who endure tension and anxiety whilst at work. The living area is large and comfortable, inclusive of DVD; TV; CD; complimentary movie & reading libraries. Quality curtains, a gorgeous Persian silk rug and limed, cedar-wood blinds ensure total comfort and absolute privacy. Our established gardens are a fusion of mature exotic trees, untouched native bush and swathes of flowering seasonal bulbs, completely embracing the apartment. The garden is a delight..... rambling and vigorously energised... lively, fresh and teeming with wild birds and animals. I've counted over 35 species of native birds flitting about ~ calm in our presence....in fact, in spring they bring newly fledged offspring to show off and discover the territory !! Challenge yourself with a hit of tennis on the full sized, synthetic grass tennis court. We provide complimentary racquets & balls....or maybe an afternoon stroll along the many lane ways on the property? For those who would like to meet the ponies, an apple, some carrots or a few slices of stale bread certainly break the ice and guarantee devoted attention. Kids are most welcome and encouraged to develop a physical contact with "the girls", but only with parental supervision. They are also perfectly safe riding bikes or roller-blades on the driveway, tennis court and lanes. Linked to the past history of our district and striking a unique and regal presence across the mews, are the eternal chimneys of the original 1890's "Ferndale" guesthouse ~ a genuine statement of prestige in the Exeter vicinity of the Southern Highlands. Interestingly, aspects of the property and chimneys have been used in several TV documentaries and programmes. In April 2013, surrounded by an autumn blessed with rampant leaf colourings, we delighted in witnessing the marriage of Ross & Heather, staged among the ruins of these genial giants; true reminders a yester-year lifestyle that was gracious and rich. A visit to "Ferndale" will re-acquaint anyone with how quality of life was meant to be enjoyed. .......yet only 5 minutes to BUNDANOON, EXETER or SUTTON FOREST for shops, cafes, supermarkets and local cold-climate vineyards and cellar doors. BOWRAL, ROBERTSON - approximately 35 minutes. This property is an ideal hide-away; a delightful retreat from modernity, city noise and hype.....but with that personal touch from owners who care. We had a wonderful weekend getaway at Ferndale. Helene is friendly, accommodating and communication with her was very easy. The cottage is clean and well-equipped, with a very comfortable bed. We appreciated the food basket and fresh fruit on arrival. My son enjoyed meeting the animals, but the highlight of his trip was undoubtedly the tractor ride around the farm. Thank you! We had a lovely, relaxing stay. After a day of mountain biking we sat down and looked out over the gardens and fields filled with cows, lovely! Very clean and spacious accommodation. Helene, the host is lovely, very caring. 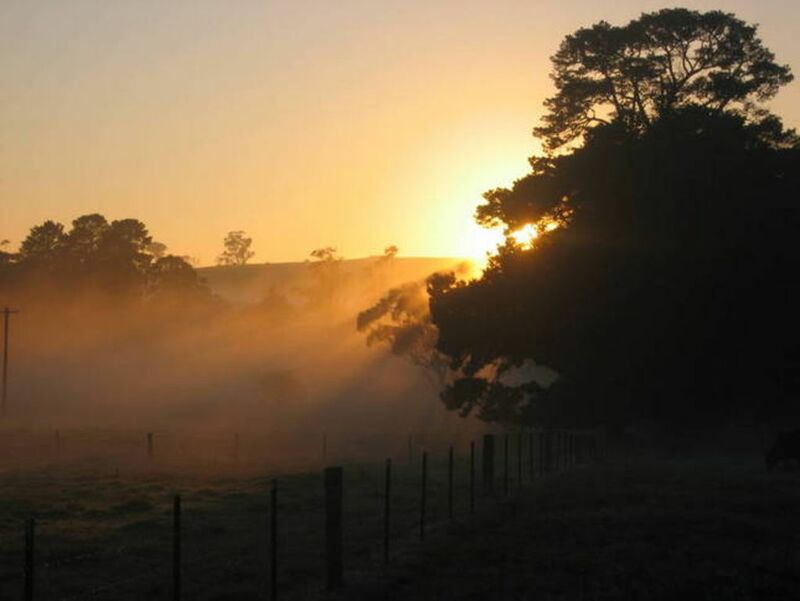 Ferndale is a nice escape from the city but accessible to shops, cafes, wineries & the bush! The property was very clean & tidy with lovely breakfast provisions & a full kitchen for self catering. It was warm & cosy when the weather turned cool & a lovely garden & farm to explore when the sun came out! We loved Helene's place. It was so clean and well provisioned we wanted for nothing and wished we could have stayed longer. A lovely welcome from Helene and Gracie the very happy little Kelpie! Thanks for a lovely get away. We loved our family stay at 'ferndale'. Walking the farm, seeing the animals, even a wombat! Thank you to our fantastic hosts Helene and David. Fantastic accommodation!